Wishbone Flower is an erect, bushy annual with toothed ovate leaves and trumpet shaped flowers. The stems and 5 cm long opposite leaves are hairless. Plants make a compact, upright bush of 20-30 cm in height. The showy flowers are velvety, about 3.5 cm long and 2.5 cm across. 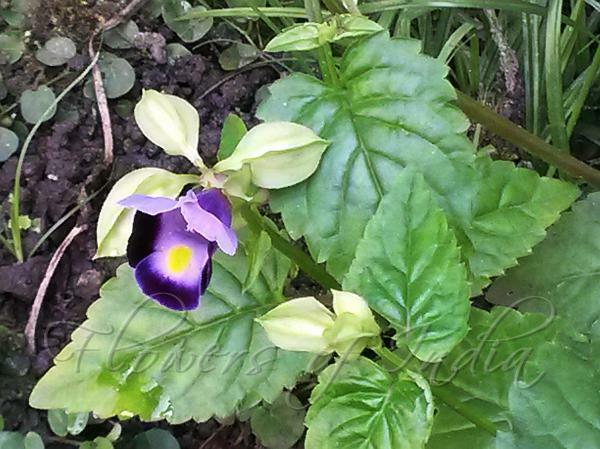 They are pale violet and have deep purple blotches on the lower petals with yellow inside. Flowers bloom throughout the summer and autumn. Wishbone Flower is native to Cambodia, Laos, Thailand and Vietnam. Identification credit: Navendu Pāgé Photographed in West Bengal & Andaman & Nicobar.